Róbert Spencer er langt í frá ánægður með heimsókn sína til Íslands. 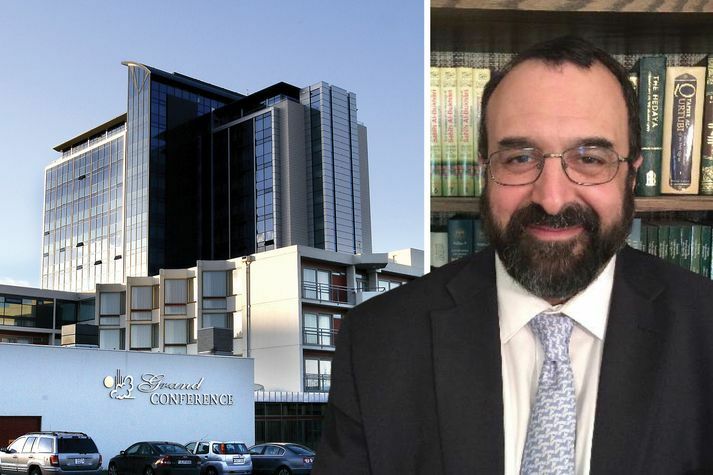 Robert Spencer segir íslenska fjölmiðla hafa lagt stein í götu sína, alið á ranghugmyndum um sig með þeim afleiðingum að ekki einn einasti íslenski stjórnmálamaður vogaði sér að mæta á fyrirlestur hans. Þetta sé uggvænleg staða sem íslenskir stjórnmálamenn hljóti að velta fyrir sér. Þá segir hann vinstri mann hafa eitrað fyrir sér. Róbert Spencer, sem hélt á dögunum fyrirlestur á Grand Hótel, sem mikið hefur verið til umfjöllunar, hefur skrifað opið bréf hvar ofangreint kemur fram. Hann stílar bréfið á stjórnmálamenn og fjölmiðla á Íslandi eða fjölmiðla-elítuna, eins og hann kallar það. Bréfið má sjá í heild sinni hér neðar. Hann nefnir sem dæmi að sér hafi saklausum verið spyrt saman við Anders Breivik, en hann beri ekki meiri ábyrgð á fjöldamorðum hans í Útey í Noregi en Bítlarnir á morðum Mansons. „Eins og þið á fjölmiðlum vitið var þetta aldrei borið undir mig,“ segir í bréfinu. Þá lýsir hann því þegar eitrað var fyrir sig en Vísir hefur þegar greint skilmerkilega frá frásögn Spencers af því. Spencer segist hafa lært sína lexíu. Að íslenskir fjölmiðlar séu málpípur vinstri manna sem vilji teikna sig upp sem rasista og kreddufullan hatursmann íslamista. Með slíkum heilaþvotti fylgi hatur og sú sé ástæðan fyrir því að ungur maður reyndi að eitra fyrir sér. Ég er viss um að sá sem eitraði fyrir mér er ánægður með sig og það sem hann gerði. Og ef hann segir einhverjum frá því er ég viss um að hann verður hylltur sem hetja. Robert Spencer segir þessar aðferðir nákvæmlega þær sömu og nasistar beittu þegar þeir voru að afla sér fylgis meðal æskunnar. Honum varð hugsað til þeirra tíma þegar hann lá á sjúkrabeði sínu í Reykjavík, hvernig vinstri menn skrímslavæða andstæðinga sína í dag með nákvæmlega sömu afleiðingum. 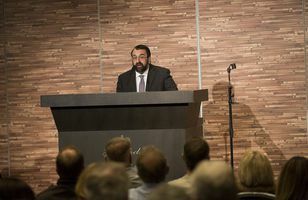 „Ég upplifði nákvæmlega það í hinni ólukkulegu heimsókn til hins lukkulega lands ykkar,“ segir Robert Spencer. After I spoke this week in your beautiful country, I was poisoned by a Leftist in Reykjavik. I should have seen this coming, even in your normally placid and peaceful land. As you may be aware, my visit garnered a great deal of attention from the Icelandic press. All of it, without exception, was negative. All the stories about my visit had the same elements, as if every reporter was working from the same talking points: there was the false claim that I incited the Norwegian mass murderer Anders Breivik to kill (in reality, I’m no more responsible for Breivik’s murders than the Beatles are for Charles Manson’s); there was the information that I was banned from entering Britain, with no mention of the fact that I was banned for saying that Islam has doctrines of violence(which is like being banned for saying water is wet) and for the crime of supporting Israel; and there was the fact that the SPLC 1 claims that I purvey “hate speech,” which is a subjective judgment used to shut down dissent from the establishment line. As you in the Icelandic media know, no Icelandic media outlet contacted me for rebuttal to these charges, or for any kind of comment at all. These stories, which were clearly intended to shame people into avoiding my lecture, worked on Iceland’s politicians, none of whom attended. Nonetheless, 500 brave Icelanders did come to Reykjavik’s Grand Hotel to hear me and my Jihad Watch colleague Christine Williams. The Icelandic media was unmoved, giving the 50 protesters 2 outside far more lavish and respectful coverage than was given to anything that happened inside. A TV station aired an interview with me in which the interviewer refused to believe that I did not feel responsible for the Breivik murders, and asked me about them again and again. Articles after the event included quotes from the protesters, but none included even a single quotation or description of anything we had actually said. Clearly this is a subject that Icelandic politicians and media opinion-makers do not want Icelanders to discuss. We left. But it was too late. Back in my hotel room, I began to feel numbness in my face, hands, and feet. I began trebling and vomiting. My heart was racing dangerously. I spent the night in a Reykjavik hospital. It quickly became clear, and was confirmed by a hospital test, that one of these local Icelanders who had approached me (probably the one who said he was a big fan, as he was much closer to me) had dropped drugs into my drink. I was ill for several days afterward, but I did manage to get to Reykjavik’s police station and give them a bigger case than they have seen in good awhile. The police official with whom I spoke took immediate steps to identify and locate the principal suspects and obtain the restaurant’s surveillance video. I’m not going to call him, but Icelandic police will be contacting him soon enough, if they haven’t done so already. I did, however, look at his Facebook page, and predictably saw nothing on it to indicate that he might be a “big fan” of my work, or that he held any views out of the mainstream, which is, courtesy of Iceland’s political and media elites, dominated entirely by the Left. It was likely just this simple: this young man, or whoever drugged me, heard that a notorious “racist” was coming to Reykjavik, happened to see me in the bar, and decided to teach me a lesson with some of the illegal drugs that are as plentiful in Reykjavik as they are anywhere else. I learned my lesson. The lesson I learned was that media demonization of those who dissent from the Leftist line is direct incitement to violence. 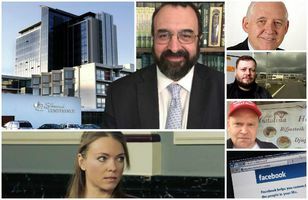 By portraying me and others who raise legitimate questions about jihad terror and Sharia oppression as racist, bigoted Islamophobes, without allowing them a fair hearing, the media in Iceland and elsewhere in the West is painting a huge target on the backs of those who dare to dissent. Not only does the Left fill those whom it brainwashes with hate, but it does so while portraying its enemies as the hatemongers, such that violent Leftists such as the young man who drugged me feel righteous even as they victimize and brutalize conservatives. I have no doubt whatsoever that whoever poisoned me in Iceland went away feeling happy over what he had done. If he told anyone what he did, I’m sure he was hailed as a hero. Meanwhile, in Iceland and all over the West, as Leftist students riot and physically menace conservative speakers and Leftist spokesmen frequently indulge in the most hysterical rhetoric to defame their foes, politicians cower in fear and decline to discuss these issues, only ensuring that the problems I identified when I spoke in Reykjavik will continue to grow in Iceland and elsewhere. The Nazis indoctrinated their young followers with the same message as they were rising to power in Germany in the 1920s and 1930s. We all saw where that led. 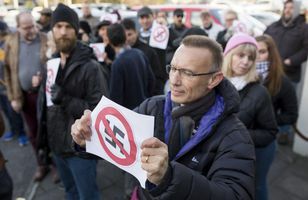 As I lay in my hospital bed in Reykjavik last week, I thought about those days, and about how the Left’s demonization of its opponents today will lead to exactly the same thing. I experienced it myself, in my unhappy visit to your happy land. Af hverju var hann ekki með límmiða? Deildar meiningar eru um byrlun í glas Roberts Spencers, ýmist hefur fólk hana í flimtingum eða talar um morðtilraun. Nokkur hópur safnaðist saman til að mótmæla komu fyrirlesarans Roberts Spencer fyrir utan Grand Hótel í gærkvöldi á samstöðufundi á vegum Solaris - hjálparsamtaka fyrir hælisleitendur og flóttafólk á Íslandi.